The "Toy Fair" as it looked in the early 1950's. 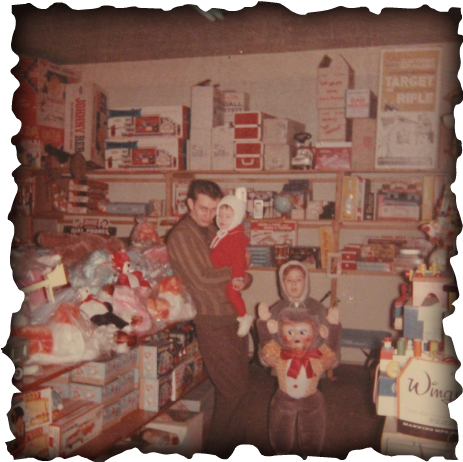 In 1950, a local businessman by the name of Doran Sammons had a small business on Elk Avenue in downtown Elizabethton called the Toy Fair. The store had been built in front of a wood framed house that stood a few feet off of the main road. The front porch of the house was actually part of the inside of the store. You can see the roof line of the house in the photo above. The Toy Fair was originally a fruit stand and a news stand. They also sold fishing tackle, and various toys and hobby items. Richard Sammons (Son of Doran Sammons) and his family inside "Toy Fair"
One day in the summer of 1950, Doran decided to take a walk down Elk Avenue with the intention of buying a hotdog at a local drugstore. After he placed his order, he waited more than 30 minutes for his hotdog and when it arrived it was cold. In his disgust, Doran deivsed a plan as he walked back to his store. Being the businessman that he was, he realized an opportunity that he could not resist. Doran got a sledge hammer and knocked a hole in his storefront on the far left side. 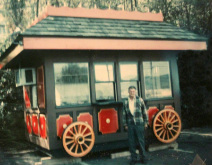 He made a window to a small narrow room that would eventually be know as Sammons Hot Dogs. The room had one small burner unit where the hotdogs were cooked. A piece of chicken wire was placed over the boiling water pot which would steam the buns. The price of a hotdog was only 10 cents. Sammons was almost an instant success. Sammons would become known as “The Hole in the Wall” and would be successful for many years. The cash box was a “Have-a-Tampa” cigar box with a piece of wood that was hollowed out for coins. Soon after, Doran opened the hotdog stand, he visited the local bakery and ordered 35 dozen hotdog buns. The bakery owner said “Doran Sammons…You’re crazy. We don’t sell that many hotdog buns out of this bakery in a month for the whole county. If you order that many buns, you will have to eat them because we aren’t taking them back. To the baker’s surprise, Doran returned the very next day to place another order. The very first year, Doran sold over 180,000 hotdogs. At .10 cents each, it wasn’t a lot of money but a Carter County "icon" was born that is still recognized today. Virtually anyone that has lived in this county has experienced a Sammons Hotdog. Although no stores were open on Sunday back in those days, Doran would find that Saturday would be his biggest sales day of the week. One Saturday he sold more than 1000 hotdogs. 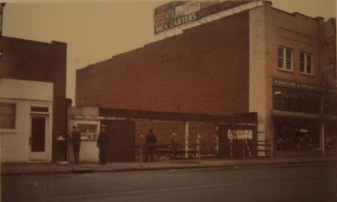 In 1971 the original "Toy Fair" building was torn down and was replaced with a larger building that would be exclusively used as a dine in restaurant. The menu was mainly made up of burgers, sandwiches, pizza, and of course, hot dogs. Several locals worked for Doran and his business continued to grow. After 28 years of selling hotdogs and a few other items, Doran Sammons would decide to retire in 1978. He sold his business and “Sammons Hot Dogs” was just a memory. Another owner would take the building and open a restaurant but would not have the success that Doran had. It only took a few months for Doran to realize that retirement was not for him. After being overtaken by boredom, Doran would venture to Johnson City and purchase a small building on North Roan Street near where Starbucks now sits. It was a shaped like a wagon and was called the “Peddler’s Palace”. He relocated the building back to Elizabethton and placed it near the railroad tracks below Bemburg Hill. It is the location beside where the Verizon business is now located. The convenience of the new location and the fact that “Sammons Hot Dogs” was back in business, would be create another instant success for the Sammons family. The small building would soon need expansion and the icon was reborn. The decade of the 80's was a very prosperous time for the business and it was decided in 1987 that a second store would be placed on the 19E Bypass near the Betsytown Shopping Center. In 1999 when the lease on the older building was nearing the end, it was decided that the facility on the west end of town would be moved from the rented space to a new building that would be owned by the business. This was a questionable move since the west end of town was not as densely populated at the time and there were only a few other businesses in the area. But once again, this would prove to be a pofitable move and the two locations continue to do well today. The business is still managed by the Sammons family.. They have attributed a large part of their success to conducting their business with consistent biblical principles and creating a positive environment for their employees. The menu has been simplified over the years but high quality and great service are still the main focus of the business. For more information, visit their official website at www.sammonshotdogs.com . A special thanks to Richard and Denise Sammons for sharing thier story and family photos in the quest of documenting the history of our county. This is a wonderful photo of the Cole Sammons store in the early years. As you can see, the store was more of a fruit market and news stand then. Also notice the vintage parking meter and the wonderful old street light. If you look real closely, you will see a scale beside the store window. If I recall correctly, this was a penny machine that would give you your weight and maybe even a fortune. This photo was taken from inside a car that was cruising by.